Explore and learn about the Tarot … and yourself! All content is © James Ricklef, unless otherwise noted. Unauthorized use and/or duplication of this material without express and written permission from this blog’s author and/or owner is strictly prohibited, so if you’d like to use anything on this site, contact me. 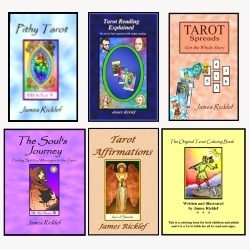 Excerpts and links must be accompanied by full and clear credit to James Ricklef and James Ricklef’s Tarot Blog, with appropriate and specific direction to the original content. If you enjoy the free content of this blog, please consider making a donation using the button below. My PayPal account can receive your donations and will convert from your local currency, and you don't need a PayPal account to make a donation. Thank you! Note: Advertisements on this page are generated by WordPress and benefit WordPress only. I neither endorse the ads nor encourage you to click on them. What does the Emperor card mean? What does the Nine of Wands mean? What does the Moon card mean? What does the Ace of Swords mean? What does the Devil card mean? What does the Two of Swords mean? What does the Fool card mean? Please do NOT “re-blog” my posts. I may allow a short excerpt with a link to my post, but ask permission and advice first.